Hello sunshines, our prayers have been answered. The weather is great in the Netherlands, finally!!!!! 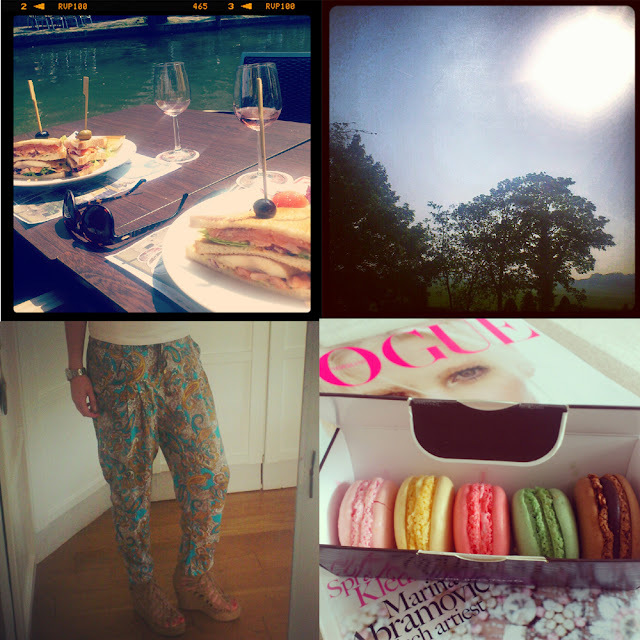 Here a little diary post about last week. I'm studying in Utrecht for almost a year now and I still don't really know the city itself. My classmate Yvette had that same feeling, so we decided that we have to give Utrecht a chance. And with this intention, we went to the city center for a delicious lunch with some wine. When I came home, my new H&M pants arrived. I love it! The print, the colors and it's sooo comfortable! Oh and the last picture are the delicious macaroons I've bought from the cutest shop ever in Utrecht. I bought a new nail polish yesterday and I just couldn't wait to paint my nails with this lovely color. I can't get enough of all the cute colors this spring/summer, whether it's pastel, bright or neon, I love it! And don't you just love this ring? I bought it when I was in Antwerp, at River Island. Yessss it's time for another outfit-post again. And although it's supposed to be spring by now.. the weather is still quite disappointing. It looks more like it's Autumn, but well.. I think every Dutchie is pretty used to that. The only thing is that this weather doesn't really motivates you to dress up. I just want to put my big, comfortable sweater on but no no.. Let's add some pastels to my outfit!